OUR PRODUCTS ARE ALL "GLUTEN FREE"
All of our vegetables are picked & packed by hand in the same day to ensure the freshest and highest quality. 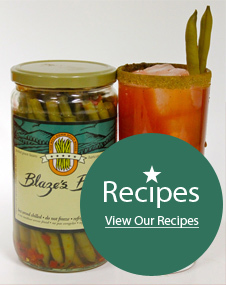 Blaze's Beans brine is an all natural recipe and has won several awards since 1994. Peppers, Carrots, Asparagus - Oh My! Blaze's Beans has expanded - and we're not talking just office space. Our new Blazing line of products are sure to hit the spot in your Bloody Mary Bar Sunday or any other day of the week you choose. 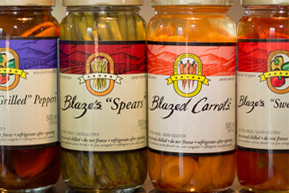 We've added some unique flavors for you to try, such as: Blaze's Grilled Peppers, Blaze's Spears (Pickled Asparagus), Blazed Carrots, and Blaze's Sweet Peppers. Changing the way people garnish their Bloody Marys/Caesars Blaze's beans adds a little more flavor to your drink. The perfect spice and garnish for your cocktail has arrived. 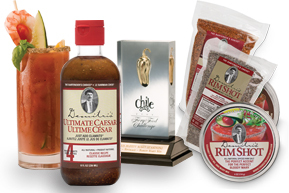 Learn more about Demitri's and how to make the perfect Bloody Mary / Caesar! 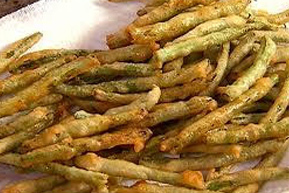 Try this delicious recipe, Blaze's Spicy Deep Fried Green Beans. Very Tasty Appetizer!! Look at what celebs like Blazes all natural tasty veggies! Which of your favorite stars likes a pickled bean. Our brand has won awards, we believe the process of which we pickle, allows our vegetable's "Asparagus, Beans and Carrots to remain crunchy" and this creates a more tasty experience than our competition.